Photo courtesy of Russell Solomon. 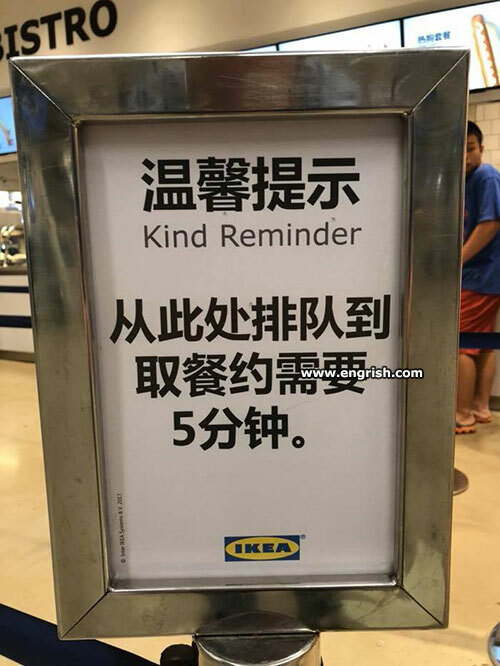 Kind reminder: Please complete translation of sign ASAP. It’s a cue. A far cue. You no learn Chinese, you go to re-education camp! I’m having trouble putting it together. IKEA? GOD? What did the poor Chinese do, to have this crappy junk foisted upon them. Hopefully, 3D Printers will be the end of IKEA. That way, everyone can make their own flat-pack junk. Or even design it. So they will have no one to blame but their own stupidity. Borg d borg d borg. The other great thing about IKEA, is you can never take it back for a refund, because you have Buckley’s chance of getting all the $hite back into the original packaging. Guess they think non-Chinese speakers are accustomed to long queues and therefore must not be informed about them. Marum | 6:55 am: The Chinese? I thought they invented crappy junk! @DnT .The Chinese are merely following the path trodden by he Japanese, in the 60s. ie; Come in at the bottom end of the market and flood it with cheap – imitation – junk, and then, gradually move upmarket. Look at Samsung electronics, Honda motorcycles, Hyundai supertankers, and cars. The Koreans did it too, as you may note. So why not the Chinese? I don’t know about anyone else, but I would expect Gods to be self-assembling.